Tips and Tricks : Here are 25 DIY projects to create using hand prints, fingerprints and even footprints! You can use hands, feet and even the family dog's paws! Do you have young children, a daycare? Are you constantly looking for new ideas to have fun crafting DIY projects in order to diversify activities and creations? 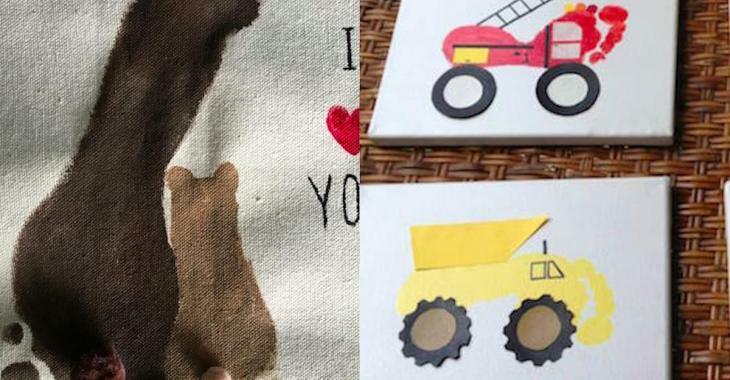 You can create beautiful greeting cards, art work that can be framed and many others using simple materials and a very personalized tool: small feet, hands or even your dog's paws! To inspire you, here are 25 original and interesting ideas! They're easy as pie and the results are amazing! How to make wonderful memories with children growing up too fast! Take a look here. You will find something fun for any occasion! A DIY that will appeal to fans of trucks and other such themes! You can then frame the works to decorate the child's room in a unique way. A beautiful way to follow the evolution of your child, while decorating a room. Each year, create a painting using his or her hand print and add the age of the child. Just lovely! Instead of simply painting ceramics, attach a message of love to the bottom of baby's feet; an everlasting memory! With the children, think up an image starting with each letter of the alphabet and draw it with the imprint of their hands. This would be a great activity to do at daycare! A pretty frame made with family foot prints, a beautiful memory! By soaking your feet in the poster paint, you can make something really great! You cannot bring the beach back with you, but you can create a souvenir! Paper, paint and little hands are all you need to bring a bunch of superheroes to life! 8. Flowers with the family dog's paws! The family dog can also participate in DIY projects! Once again, a little paint and imagination and that's it! Involve everyone to create a beautiful mural that will represent every family member. Your hands and arms will make beautiful trees! A good idea for Easter! Print the trace of your beautiful butterfly! In memory of an event, each guest can leave his or her thumbprint! Grandparents would be very happy to receive a card like this! A foot can make a pretty great ghost! Using molding putty or laminated paper, a great souvenir to take with you everywhere you go! Keep track of all your loved ones. Everyone will get a kick out of getting a card like this! Nice, in the lobby, to show your guests right away that family means a lot to you. An adorable gift, made with love! We should have thought of that! On a cloth, a t-shirt or in a frame, here is a gift that will melt the heart of any parent!